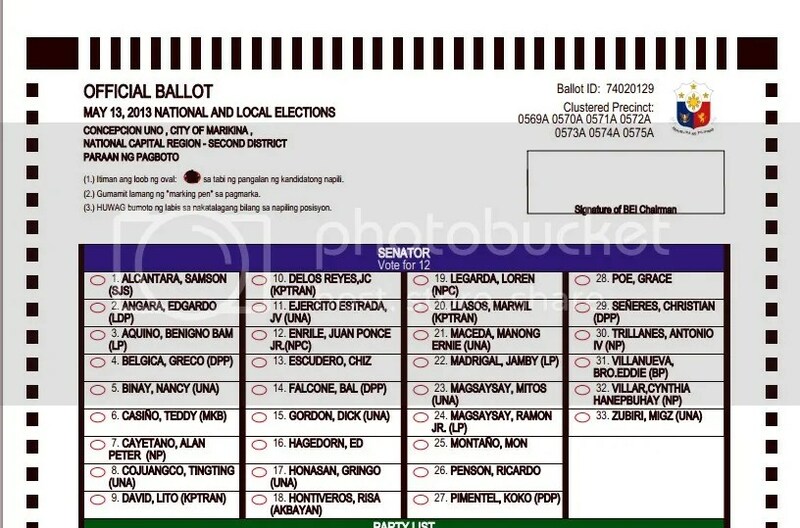 Our May 13, 2013 mid-term election is fast approaching but according to the March 15 – 17 senatorial poll survey results, only 47% of the respondents submitted 12 names of candidates they would vote for. Average fill-up rate was 9.4 candidates with most of them believed to have name recall as basis for the respondents’ choices. I will be honest and accept that, as of today, I belong to the 53% who cannot yet name the full 12 senatoriables that I will vote in the coming election. A) Political Dynasty – I am against political dynasty in government though I can tolerate two (2) from the same family as long as they don’t occupy the same position. For this criteria, I would eliminate six (6) senatoriables who rank among the Top 20 in the survey and leave twenty-seven (27) candidates to choose from. B) Leftist / Rightist Leaning – Without disclosing my own leaning, I can eliminate two (2) candidates each from either left or right among those in the upper ranks in the survey. This leaves me with twenty-five (25) senatoriables from whom I need to choose twelve (12) names. C) Oldies vs. Newbies – Though I am a new senior citizen, I would refrain from disclosing my preference on this criteria that I will use. Whichever side I will choose, I can eliminate at least two (2) candidates from each side and this would leave me with at most twenty-three (23) more senatoriables to choose from. D) Survey Rank – I am not one to join the bandwagon to be with winners. However, I, definitely would not vote for anyone landing in the 24th to 33rd slot in the last survey results to be publicly published before election day. I will not take chance and waste my vote on them. If after applying the above criteria and more than twelve (12) names remain, I will make my own ranking from 1 to 11 and raffle my 12th slot to the others who did not make my Top 11. How about you, how will you decide on the 12 senatoriables that you will vote in the coming election?